يوفر فندق Beacon Point Ocean View Villa ظروف إقامة راقية وهو خيار رائج للسياح ولرجال الأعمال أيضاً. يقع في منطقة برامج عائلية, سياحة, شواطئ من طريق المحيط العظيم - خليج أبولو. يمكن من هنا للضيوف الاستمتاع بسهولة الوصول إلى كل ما تقدمه هذه المدينة النابضة بالحياة. يشكل هذا الفندق ملاذاَ مريحاً للاسترخاء ويمنح زواره فرصة للاستجمام والتجدد، وهو يقع على بعد خطوات من المعالم السياحية الكثيرة للمدينة كمثل: Marriner's Lookout. إن الخدمات التي يقدمها Beacon Point Ocean View Villa تضمن للنزلاء إقامة مريحة. إن تسجيل وصول/خروج سريع, تخزين الأمتعة, صف السيارات, غرفة عائلية, خدمة غسيل الملابس هي جزء فقط من الخدمات التي تميز Beacon Point Ocean View Villa عن باقي الفنادق في المدينة. تتضمن كل غرف النزلاء وسائل الراحة والتسلية المصممة خصيصاً لضمان الراحة القصوى للضيوف. يقدم الفندق خدمات رائعة كمثل ملعب تنس, حديقة لمساعدتك على الاسترخاء بعد نهار طويل من النشاط والتجوال في المدينة. اكتشف مزيجاً ساحراً من الخدمة الاحترافية والخيارات الواسعة من وسائل الراحة والمتعة في Beacon Point Ocean View Villa. الحجز لنفس اليوم متاح فقط حتى 07:00 PM. The villa is a very nice & quiet place at mid hill. The view from the hotel room is very nice and the hotel facilities is sufficient for bbq and cooking. But the mountain route to go up to the hotel is abit scary. The best spot I could find in Appollo Bay. It is surrounded by gum trees, which is a home to the wild Koala. We saw Koalas on our way from reception to our cottage. On breezy mornings, we can even see a Koala right at the tree in front of our cottage. We booked into Deluxe Spa. The room-type we booked online didn't match up to what we actually got in real life. This was only an issue because we thought we had booked a room with a view of the ocean but we were set back behind other cabins. This is something that needs to be fixed on Agoda I would say. Apart from that it was a lovely place to stay and we would go back again! The view from the top of the hill is the star! The rooms are ok, have a kitchen and are spacious nothing spectacular. Check in was easy staff friendly and I would stay there again! Requirements vary for different customers. Requirements in Chinese are more strict, and penalty is much expensive on Chinese flyer. Location if the villa was very high up. You will need to drive. At night was very dark. Furthermore the night we checked in, there was a power failure making it darker. Fortunately there have back up generator so everything in the room was fine. Spent two nights at Ocean View and arrived late on the Saturday Night. Was hard to find the place in the dark as the GPS didn't register the location but once I found it past the gravel road we were pleasantly surprised with the quiet, spacious and slightly isolated location (but so close to Apollo Bay). Enjoyed this as a base to visit the sites and have a good weekend away. Didn't see any staff during the stay (arranged to pick up keys & quick drop off box) but there were no problems. Place was clean and spacious. Enjoyed our stay and would come back again. I was with my parents and my daughter. When I booked the hotel, there is slightly difference between 3 adults and 2 adults. When I check in, the receptionist asked me whether we are three adults or 2, i honestly told her. Then I was charged more 70AUD per day for the extra adult. however, we had same room as I ordered for 2 adults and I expect the extra 70 AUD should include something else. But, the truth is that we don't even have extra tower on this extra person, and since I booked for two nights, I expect the hotel would change the tower or help us to clean the room.When i get back from outside, nothing changed. Then why would I have to spend these 70 AUD more as no service at all, and the facility is all by yourself. I have to admit that the view from the hotel is wonderful, however, I really dont understand why since we book the specific room, why would you care 3 or 2 person stay in since you provide no service at all? Our stay was very nice, there was plenty of signage on the Roads, so it was easy to find. The Villa was very comfortable and appointed well, the Staff were friendly and Check In was quick and easy. We were far enough away from Town to really relax and enjoy the beautiful surroundings and view, but close enough to Town to do Food Shopping or venture out for Dinner without having to travel to Far. I guess my only complaint was that the Bed was well and truly in need of replacing, it was not a very comfortable mattress. but out of 10 I would give it a 7.5 and would not hesitate to book there again for a weekend escape. 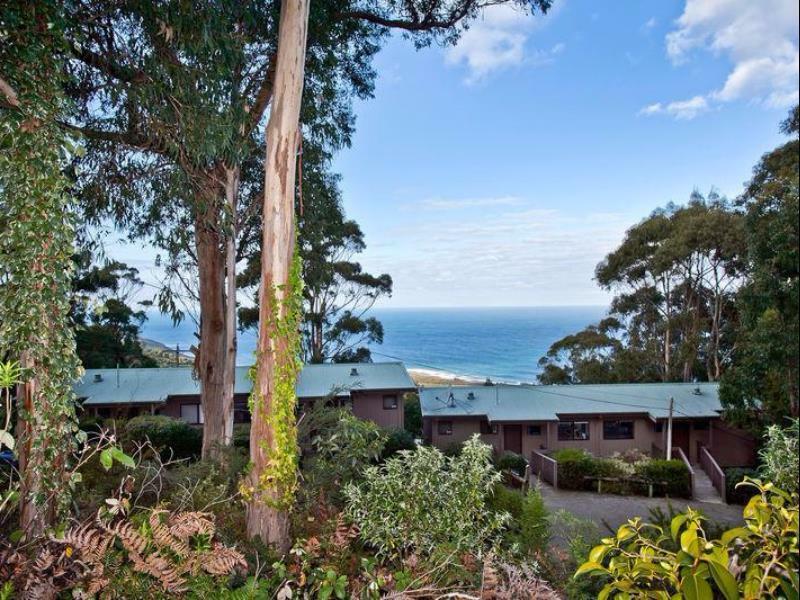 Just outside of apollo bay, amazing views and only a few self contained apartments. Great to get away from it all.. Even has a log fireplace..
We arrived in the dark at about 730, signage needs to be a little easier to find the entrance to the Villas, but once there it was easy to navigate around and find our ocean view villas. 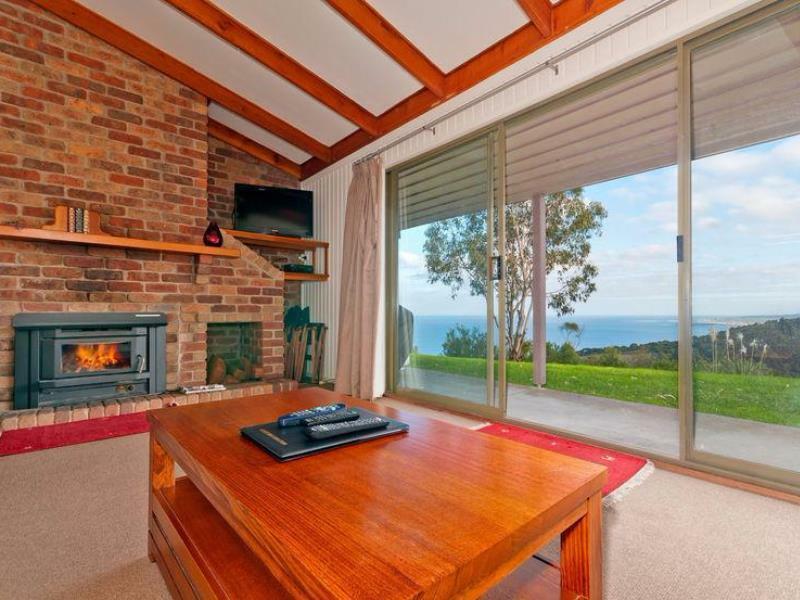 Large family room, spacious kitchen - both looking out over the ocean. Good sized bedroom and wardrobe. Washing machine and good sized bathroom. Well recommend as a place to stay. 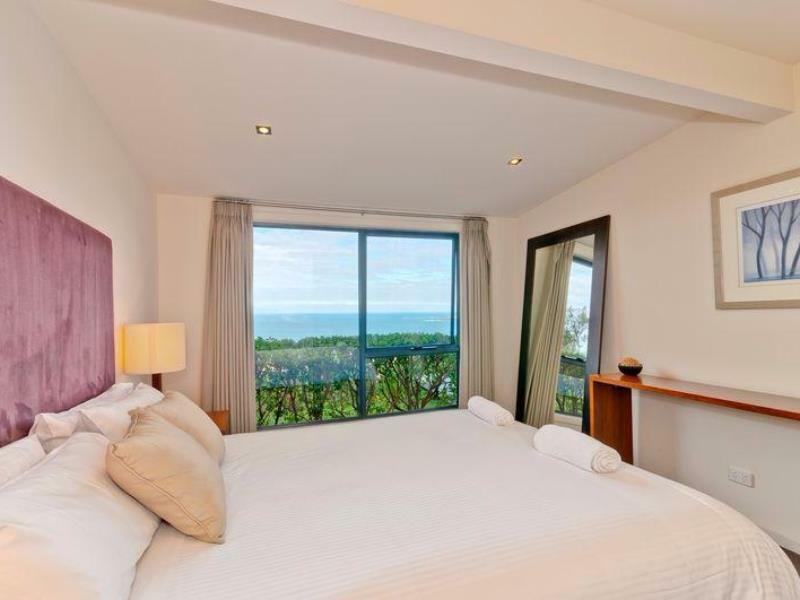 The room is located on the top of the hill looking with superb ocean view. The rooms are clean and well maintain. Cable TV provided for kids. The hotel is only accessible if you drive, entrance to the hotel is via a gravel track, so look out for the hotel signage. A hotel for a quiet getaway, it is equipped with cooking/bbq facilities, where you get to enjoy the ocean view from your villa. While it gets really dark at night and rather daunting, you get a clear sky view of the stars! The location of this hotel is up in the hills and there is no lights up the hill, have a tough time looking for it at night. The whole surrounding is very quiet. 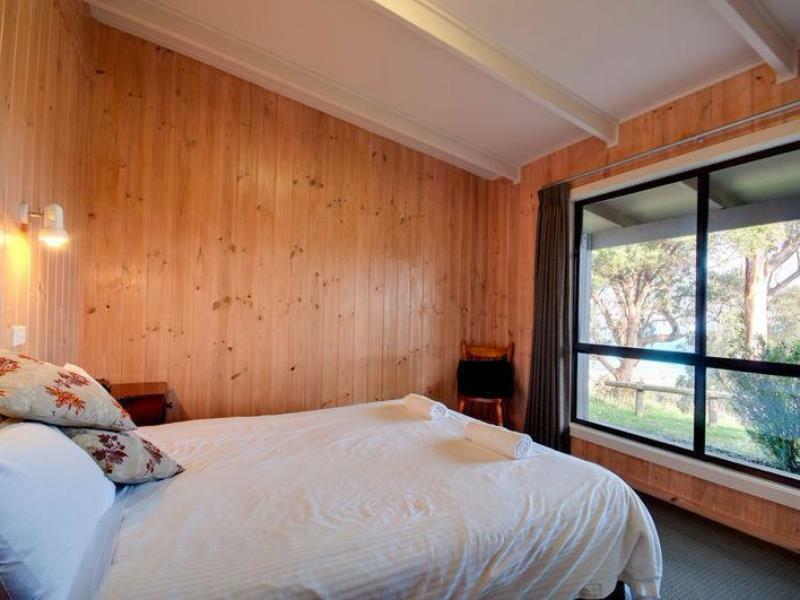 Best hotel along Great Ocean Road. Perfect spot to drop your bags at before heading down to the beach. Perfect place to catch the sunset and sunrise.